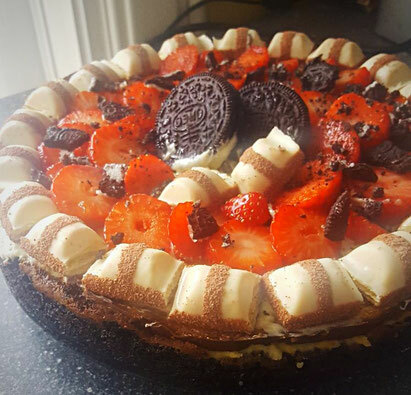 Last week I made a White Chocolate Oreo pie for my birthday and as promised here is the recipe. First I made the Oreo crust. This is very easy to make! All you need is 25 of your favourite Oreo cookies and 5 tablespoons of unsalted melted butter. Put the cookies (with stuffing) in a plastic bag and crush them until they are finely crushed. Mix the cookie crumbs with the melted butter in a bowl. Press the mixture in the pie plate, bottom and sides. Place the crust into the pre heated oven for about 8 minutes. Told you that was easy! While the piecrust is in the oven you can prepare the white chocolate filling. I don't really like cream cheese so I used crème fraîche. Chop 300 grams of the chocolate into small pieces. Place a bowl on top of a smaller pan with boiling water. Make sure the bowl does not touch the water! Otherwise you will burn the chocolate. Melt the chocolate pieces in the bowl (au bain marie). Put the crème fraîche and melted chocolate into a bowl and mix it. Add the eggs one by one and stir the mixture. Put the mixture on the Oreo Pie Crust and bake the pie for 25 minutes in the oven. 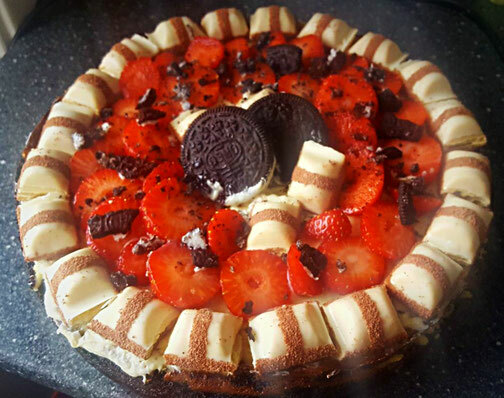 For the topping I used melted white chocolate, strawberries, white Kinder Bueno and some remaining Oreos. But of course you can put whatever you love on top. Melt the remaining 100 grams of white chocolate ( you can also choose to put Milk or Pure chocolate) au bain marie. Quickly cover the top of the pie with the melted chocolate. Break the Kinder Bueno into smaller pieces and make a circle on the pie. Slice the strawberries and decorate your pie with it. Crumb up the remaining Oreos and spread them over the pie. Your Pie is ready to eat! I hope you enjoyed this recipe as much as I did! If you have any questions leave a comment below the post.